There are 12 or 15 squares that are available for advertising on this game board. The board game for wine enthusiasts. Connoisseur is played by 2 to 4 couples. Playtime for Connoisseur: tm is 30 to 60 minutes. Connoisseur is played with one six sided dice that is numbered,1 to 6. Each game is played with four sets of cards. Each set of cards has its own category. Example. [Quotations, Astrology, Wine Master, or "Knights and Maidens"]. Each set of cards is also color coded: example [red, blue, green or yellow]. The cards are approximately 3 1/2 inches long by 2 1/2 inches wide. The cards are used in the game to assist the players in moving their tokens forward or back a number of squares, depending on the instructions on the cards, and as a source of knowledge about table wine. Other information and situations between the players is also on the cards. Each player receives a token to represent him or her on the playing board. If the player is a male then the token he selected at the start of the game will be classified as a male token or KNIGHT. If the player is a female then the token she selected at the start of the game will be classified as a female token or MAIDEN. Each game of" Connoisseur" is played with a bottle or two of premium table wine, [supplied by the HOST] and a four oz. wine glass for each player [also supplied by the HOST]. Place the playing board on the table, the players sit around it. Play starts with the HOST and moves to the next player on the right. The players sitting around the playing board should be seated in a KNIGHT, MAIDEN, KNIGHT,MAIDEN arrangement. Each player is given a token to represent him or her on the playing board, and each player is given a two to four oz. wine glass. The HOST pops a bottle of table wine then fills each players glass. The HOST then places the bottle in the middle of the playing board on the prescribed circle. The HOST then places the categorized, color coded cards on their appropriate spots on the center of playing board. Each player places their token on the starting square. The HOST then rolls the six-sided dice and then moves his or her token to the correct square. Example: [a player rolls a number 5 on the dice, the player then moves his/her token 5 consecutive squares then stops]. The HOST continues play as to the type of square he/she lands on. The play then moves to the player on the HOSTS right side. A number of the squares are color coded to match the categorized and color coded cards. Example: [if a player landed on a yellow square, the player would draw a yellow card from the top of the deck, yellow cards are categorized as ASTROLOGY the player would then read and follow the instructions on the card, then put the card back at the bottom of the deck]. Wine master squares are color coded "red". If a KNIGHT or MAIDENS token lands on a wine master square. The knight or maiden draws a wine master card. The player will then read the card and follow the instructions on the card. Quotation squares are color coded "green". If a maiden or a knight lands on a quotation square, the maiden or the knight asks any one of the other players to draw a QUOTATION card [green card] from the deck on the playing board for him/her. This player will then read the quotation on the card; but saying "BLANK" for the under lined word. The maiden or knight must fill in the BLANK with the correct word. If the knight/maiden gives the correct answer he/she follows the instructions. If the answer is wrong the player must move his/her token, via the instructions. The card is then placed back in the pile at the bottom of the deck. Knights & Maidens squares are color coded "blue". If a maiden or a knight lands on a "knights & maidens" square the player must draw a "knights & maidens" card [blue cards] from the top of the deck. If the player is a maiden follow the instructions on the card that are DESIGNATED for maidens. If the player is a knight follow the instructions on the card that are DESIGNATED for knights. Astrology squares are color coded "yellow". If a knight or a maiden lands on an astrology square, the player draws an astrology card [yellow cards] from the top of the deck. The player reads it then follows the instructions on the card. 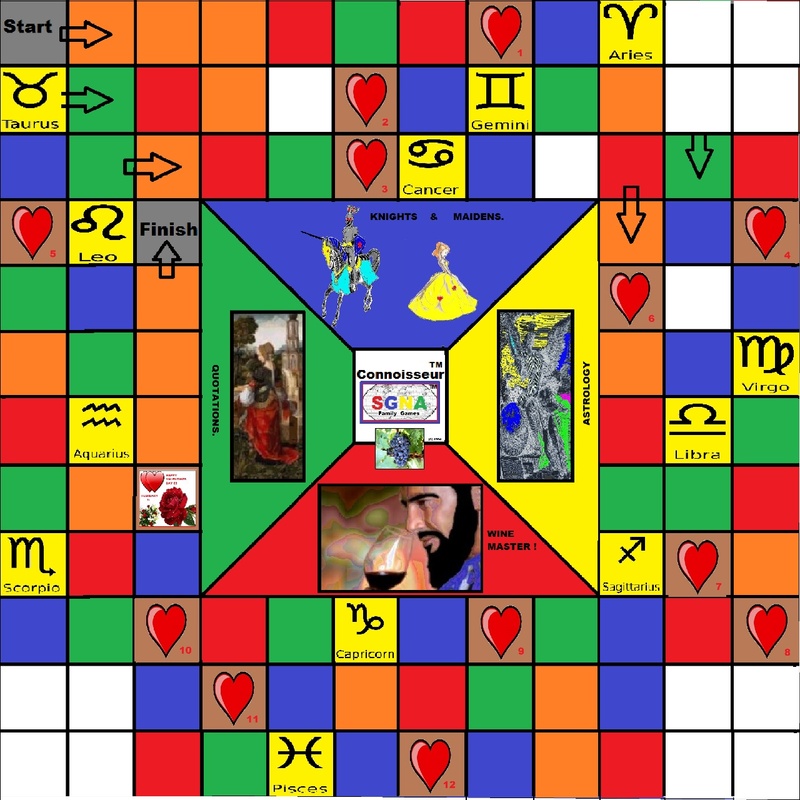 If a knight or a maiden rolls the dice and lands on an astrology square that is his or her own sign. Forget about drawing a yellow card; that was your lucky throw, so exchange places with the leader in the game or stay where you are or advance ahead two safety zones. 6} The SAFETY ZONE squares: Orange squares. More than one players token may occupy or land on a SAFETY ZONE square. Once a players token is in a safety zone square no other player can touch the token to advance it forward a number of squares or move it backward a number of squares; via instructions by cards or by JOUSTING or by QUARRELLING or by any other circumstances. token forward to the nearest safety zone square, the loser moves back to the nearest safety zone square. If it is a tie, both players roll the dice again. Both players roll the dice, the player with the highest number is the winner and gets to move forward to the nearest safety zone square, the loser stays on the occupied square. If it is a tie both players move back to the nearest safety zone square. 9.a} If a MAIDEN occupies a square and then a KNIGHT lands on the same square, the maiden must ask the knight if he would like to move back to the nearest safety zone square. If he says OK then the play is completed, if he says NO then the maiden has the choice of moving AHEAD to the nearest safety zone square or QUARRELLING. 9.b} If a KNIGHT occupies a square and then a MAIDEN lands on the same square; the knight must ask the maiden if she would like to move back to the nearest SAFETY ZONE square. If she says YES then the play is completed. If she says NO then the knight has the choice of moving BACK to the nearest safety zone square or QUARRELLING. 9.c} If a KNIGHT occupies a square and then another KNIGHT lands on the same square, then the two knights must have a drink of WINE first, to build up courage and then JOUST. 9.d} If a MAIDEN occupies a square and then another MAIDEN lands on the same square; the first maiden must move AHEAD to the nearest safety zone square. (VALENTINE'S DAY is February 14.) There are 12 valentine squares on the playing board. Each valentine square is numbered, 1 to 12. The instruction for the players [ Knight or Maiden] that land on one of these valentine squares is on a separate Valentine Card. (A Maiden) –Go to the Finish Square. 13} WINNING a game of CONNOISSEUR: TM. To land on the finish square a Maiden must roll the correct number on the dice; a Knight does not have to roll the correct number. He just has to pass the finish line or square. The first player to land on the FINISH square is the GOLD WINNER, but the game can continue until SILVER and BRONZE winners are established.